If you accept the Wikipedia definition of liberalism, you find that the current people who describe themselves as “progressive” have become very illiberal although they (and their detractors) still call themselves liberals. I recommend that we stop using these terms interchangeably because once upon a time, being a liberal meant having core values of liberty and now it is just a tribe of fascist thugs who rail against personalities. 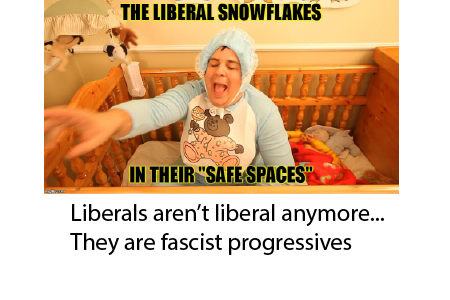 Liberalism, according to Wikipedia, is characterized by devotion to civil rights, democracy, secularism, gender equality, racial equality, internationalism, freedom of speech, freedom of the press, freedom of religion, and free markets. Modern day liberals, who more rightly call themselves progressives, fall short on all but one of these accounts. Civil Rights – Progressives want to limit people’s rights to support political expression by opponents who wear MAGA hats. They say they feel unsafe because they have equated the hats with symbols of hatred. It’s a hat supporting a political candidate, not a KKK hood. Democracy – Progressives are against making voter verification possible and want to abolish the Constitutionally established electoral college. Some believe that illegal residents should be allowed to vote and others have floated the idea of lowering the voting age and restricting voting by older Americans. Gender Equality – Many progressives want to abolish gender altogether and insist it is a social construct. The ability of transgender girls to dominate in women’s sports is just an example of an unquestioned belief of progressives. Finally, they openly denigrate men, which is not truly equality, is it? Racial Equality – Progressives want to advance agendas discriminate against certain groups, like quotas on the numbers of Asian-Americans that can be admitted to elite NYC high schools by the mayor. They believe that social engineering based upon race is not only their right, but their moral obligation. Again, that is not equality but rather historical redress. Internationalism – This one fits squarely in their wheelhouse. When you hear American progressives mindlessly parrot talking points the evils of Brexit and and the benefits of the Paris Accords for climate change, you realize they truly believe that unelected officials in Brussels or think tankers in the beltway have their best interests in mind despite the decades of post-colonial exploitation of most of the world at the hands of internationalist organizations and their corporate/deep state partners. Freedom of Speech – The way that conservatives like Milo Yiannopoulos and Dinesh D’Souza are shouted down when they speak suggests that the ACLU motto of “I hate what you say but I’ll fight to the death for your right to say it” is no longer a core value of the progressives. Any speech they hate is now deemed “hate speech”. Freedom of the Press – The embracing of the no-nothing, vapid talking heads that spew commonly-sourced nonsense in the mainstream corporate media shows that the progressives are completely obliviously to the corporate/government collaboration of modern propaganda journalism. Any narrative that goes against their manufactured world view is deemed “fake news” or conspiracy theory. Freedom of Religion – Progressives generally do well in this regard although their strong bias towards secular atheism is not to be equated with religious tolerance and they are openly derisive of many Christians if they don’t support a progressive agenda like abortion rights and gay marriage. Free Markets – Progressives want more government control of markets and have a deep mistrust of capitalism. I consider free market capitalism as untried in the American experience as the levels of cronyism between corporations and governments has never been higher. And yet somehow progressives believe that higher taxes and more government might somehow be a good thing. When I was growing up, liberalism meant something and I was proud to be a liberal. Ironically, modern liberalism, now that it has morphed into progressivism, are victims of their own success. We live in a much more tolerant society. But the values of liberty listed above are no longer important to progressives. They have bought into Mao’s idea of “perpetual revolution”. In other words, every group that holds power does so not by virtue of virtue but as a result of the unjust application of power. Therefore progressives, like the other utopian crusaders of the past, will not rest until society and all its institutions that have any vestigial ties to gender, class, race, capitalism, and religion are destroyed and replaced by a utopia of uniform thought and belief around the notion that “freedom is slavery” and that history is a Hegelian dialectic meant to grind all people into sameness. Let us not forget that progress was also the core value of Hitler, Stalin, Mao, Pol Pot, and many other authoritarian movements. I submit that there is a point at which a nation exists in pretty satisfactory equilibrium and that the pursuit of progress for its own sake is not at all liberal but rather becomes authoritarian and fascistic. 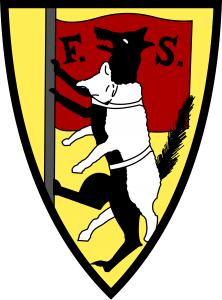 Consider the logo of the Fabian Society, a very old British socialist think tank that was very steeped in the “progressive” racist ideologies of the early 20th century that led to Margaret Sanger and the Nazi movement. It is a wolf in sheep’s clothing. It would appear that in the name of progress, liberalism in all its wonderful core beliefs save internationalism, has been taken over by people that stoke the flames of fear, division, and subversion of the core principles of our American Constitution for some idea that change, for its own sake, is a virtue. Gone are the days of “live and let live”. It is now a culture war of submit or die. If you don’t think there is a culture war, read my recent blog about the alleged rise in Naziism in my neighborhood based on some stupid kids playing beer pong. In an epic troll/LARP (live action role playing), an Infowars reporter tried to circulate a petition to send conservatives and Trump supporters to “reeducation camps” and was received with a modicum of support. I hope the people who went along were a small numerator in a larger denominator, but I just don’t know. Maybe her name, “Jenna Talia” should have been a tip off that she was trolling? I much rather prefer to believe that the majority of people are good and able to exercise moral agency. This piece on “What Would You Do” clearly shows that despite political biases, most people are decent and know right from wrong. This is a very thoughtful article that makes excellent points. It expresses the problems we face as a basically free and tolerant society. Most progressives are too young to remember or to even have studied the history of fascists and dictators such as those you mention. May your enlightened spirit illuminate much that is dark in society today. Thank you, Mark. Kids are very vulnerable to programming. Excellent piece and compilation. The progressives are anti-intellectual fascists, blindly pursuing an ideology that has in the past piled up far more corpses than Nazism. Thank you Dr. Park for your honest assessment of our times. When will the rest of society take the red pill? I think the fever will break when we are allowed to ask the right questions. As long as we are locked in some crazy left/right tribal warfare, we won’t see who is running the Punch and Judy show. Thanks for your feedback. I am sure that your opinion represents others. I don’t consider myself right wing but that is your right to interpret it that way. Very thoughtful and challenging article Ed. Our very human need for tribalism makes it very easy to forget that we are all One and that our hearts, rather than our heads, need to direct us to right action. Never too many reminders that the flawed reasoning of our minds, cultures, religions, cannot take the place of the morals of true empathy. Thanks, Ann-Toy. I hope that people will become more loyal to their morals and each other than their tribes. If we allow ourselves to accept lies and intimidation over the truth, then what are we fighting for in the end?